Who needs a tired, washed out and expensive way to experience the true Puneri spirit when you can soak in all Pune has to offer and more in just INR 50? We couldn’t believe it ourselves, take a look! The largest synagogue in Asia, the Ohel David Synagogue in Pune serves the small Jewish population in the city. Built by David Sassoon, its iconic red brick structure stands out, making it unmissable for the commuters on Moledina Road. It has no entry fee for its visitors, however, non-Jewish visitors need to take an appointment owing to security concerns. Walk down the road of the synagogue and find the JJ Garden Vada Pav Centre, forever bustling with activity on an otherwise unassuming lane. The vada pavs here are something people swear by and have been a favourite for years. Priced at a humble INR 15 for one, you can easily make a meal out of it. Do try their masala tak as well for INR 10. 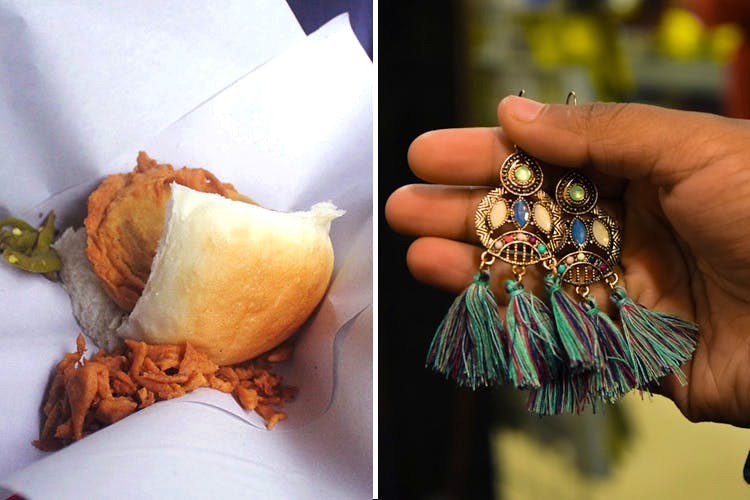 Pune’s must-visit shopping destination is not for the faint-hearted. Laxmi Road’s offerings are much more than just the small, cramped shops selling the most unique items or the never-ending rows of roadside stalls with hawkers getting louder as the crowd swells. The jewelry you find here ranges from earrings to anklets to nose rings and can be bought for as cheap as INR 15. A hillock near the Swargate bus station in Central Pune, you have to climb up 108 steps to get to the top. At the top, there are 5 temples where the main one, Devdeveshwara, is made of black stone. These details are peripheral compared to the panoramic view it offers you of the entire city, making it a regular place for all photographers and people who want a change in view. The entry is free but if you wish to visit the Peshwa museum at the top you will have to pay INR 5. We all love when the food served to us delivers on quality, quantity and doesn’t burn a hole through our wallets. At Burger, the portion sizes are what keeps their customers coming back along with the fact that the price for one is INR 50. They have two branches in Pune, one in Camp and the other in Mundhwa.